Accessories — M2 Associates Inc.
We offer only NEW CCD and CMOS cameras. These camera systems are C Mount, Color USB2 cameras. All of our camera systems come with the Lumenera Image Analysis Software. This software allows for CD, Point to Point and other various measurement options. Lumenera Camera software comes with Image Stacking and Image Stitching options. 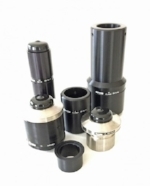 C-Mount Video Couplers and Coupler Camera Mounts, for all popular OEM Microscopes are also available. Boom Stands, Actuated Arm Stands and Rack Stands our some of the basic Zoom Pod holder options. We also offer LED Ring Lights, LED Fiber Optic systems as well as standard Fluorescent Ring lights. Other accessories include Focus Arms, Reticles, eyepieces and various C Mount options. High Power Accessories: Nomarski NIC or DIC, supplemental Lenses such as 150X or 2.5X objective lenses. Special C mount camera mount options are also available. Stands and Stage: NEW Microscope Stands that will handle 6- 12 inch Round Substrates. These stands have other options such as auto nosepiece turret configurations or Z Stand configurations. Stages are standard 4″ up to 12″ manual Stages. Wafer Loaders: Custom configured wafer loaders as well as reconditioned Nikon or Olympus wafer loaders. Systems set up to handle up to 8 Inch wafers.